I love cherry pie. I love it so much, that one year my sister brought it as my cake to the restaurant where we celebrated my birthday. I think I remember being slightly shocked that she actually brought it as my birthday cake. I did like it. What’s not to like about cherry pie? And then there’s chocolate cake. 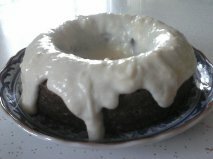 And then there’s my new obsession: chocolate cake with cream cheese frosting. This is beyond, beyond good; it’s all you could ever want in a cake. Rich, moist chocolate cake with just the right amount of frosting you can eat from the bowl. In other words the frosting you really, really like, because most frostings you just don’t enjoy quite as much as cream cheese frosting. I have hoarded this frosting in my frig after decorating a birthday cake, just so, you know, I can take spoonfuls of it straight to my mouth or try it on something you wouldn’t dare eat in front of anyone else. One of my favorite sites for recipes is allrecipes.com. This is because you can enter in servings and the recipe will be adjusted to make just that amount. Obviously, I don’t need 24 servings of chocolate cake…I wish I could come up with a good reason to make a big cake, but…So I changed the serving size to 6 and ended up with a perfectly sized cake – for me – with frosting. This recipe is from allrecipes.com, tweaked slightly by me. Preheat oven to 350 degrees. Prepare a small pan with cooking oil (or spray) and dust well with flour. Mix all dry ingredients with a whisk in a medium sized bowl. Mix wet ingredients in a small bowl or measuring cup. Pour the boiling water into the dry ingredients and whisk. Pour in wet ingredients. Whisk for a few minutes. Mixture is very thin. Pour batter into prepared pan and bake for approx. 15-20 minutes. Make sure you watch the cake after about 15 minutes, as my oven is a sad story, mine had to bake for 30. One bite for me…Two bites for me…Three bites for me…It’s all mine and I’m pretty happy about that! I am pretty sure this cake won’t be around tomorrow; may as well start the year off right! For those of you interested, this is day one of week one of my 52 weeks at $30 a week. All of these ingredients I already had.